Home » Posts Tagged "Mercedes-Benz #NYFW"
Day 4. 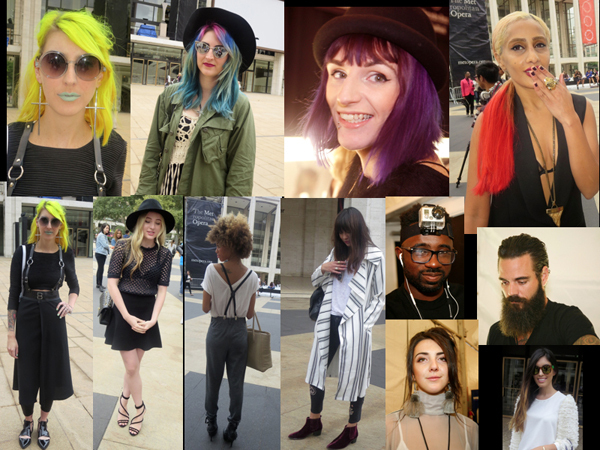 Seen on Scene with fab fashionistas at Mercedes-Benz NY Fashion Week for Spring 2015. Top Left To Right: Neon yellow hair, with Pravana, celadon colored lips on Sarah Stallman, Fashion Editor, Alive Magazine … today’s colorific hair, with Pravana, worn with vintage everything by Brittany Browers, of DJ TrashTalk – “Lace&Dagger blogger, dreamer, wanderer, professional stay-out-late-r” … Purple hair on Kim Hazelton, hairdresser working backstage for Peter Gray at Badgley Mischka (it was a truer purple in reality) … Red hair at ends on Khaleda Rajab a Bahraini designer with an haute couture boutique in her country. She is wearing bcbg with a Givenchy necklace, a Chanel bag, Christian Louboutin shoes, with red you know where to match her hair color. Bottom Left to Right: Sarah Stallman wears black fashions by Michael Drummond with her yellow hair … Another great hat and black fashions head to toe … Ashley Chew, who does her own hair, stylishly puts a Zara top and Forever 21 pants together with braces … Wonderful white and black coat by Cameo is worn by Natalie Suarez of natalieoffduty.com … Othello Banaci of fashionizer.tv and his GoPro camera on his forehead to capture what his other cameras could not, photographed backstage at Badgley Mischka … Groomed full beard on hairdresser Charlie Price of Hair by Charlie at the Badgley Mischka show … Future fashion designer, Cavan Mcpherson, a Badgley Mischka intern, made her earrings and high necked dress herself … Tala Samman of Dubai and myfashiondiary.com wears Fendi glasses with a Poca blouse.